Foam From Above: Nerf News: Overwatch Nerf Rival D.Va Blaster revealed! Nerf News: Overwatch Nerf Rival D.Va Blaster revealed! SHANGHAI – August 3, 2018 – Blizzard Entertainment arrived at ChinaJoy, China’s Digital Entertainment Expo & Conference, with a special reveal for fans of Overwatch®: a sneak peek at theNERF RIVAL OVERWATCH D.VA blaster. Designed in the style of D.VA’s signature accessory in Overwatch, the blaster is not only true to the game, but also a fully functional NERF blaster. The D.VA Blaster is the second in the series developed in a collaboration between Blizzard Entertainment and the NERF Rival brand to bring iconic Overwatch accessories to life. Fans of the team-based action game will enjoy custom NERF RIVAL rounds with the Overwatch logo that are specifically colored for each blaster. The blaster holds three NERF RIVAL rounds, and blasts at a velocity of up to 80 feet per second. 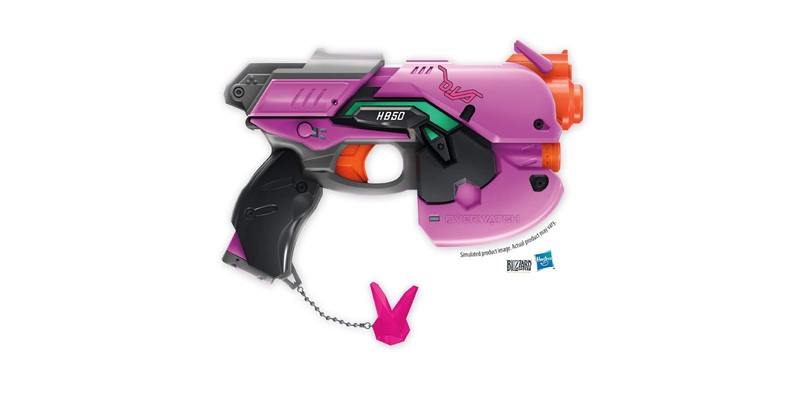 It will come equipped with a spring-action mechanism, a ready indicator, and a safety lock, and it even features D.VA’s signature bunny charm. With a player base of 40 million, Overwatch’s wide appeal continues to drive a robust merchandising program with brands like NERF. Blizzard Entertainment first teased this collaboration on Twitter on May 16; further details were unveiled during a panel discussion at Comic-Con International: San Diego by members of the Overwatch development team, including a look at the first blaster in the series: the NERF RIVAL OVERWATCH REAPER WIGHT EDITION blaster.